Paulo Avelino shows that in every battle, heroes are also human beings. General Antonio Luna has been killed, but the war is far from over. 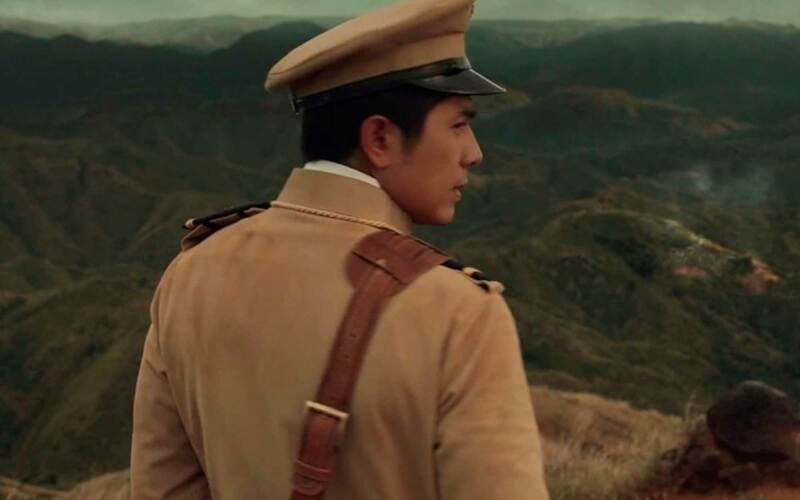 Known by many as "the President's favorite," Gen. Gregorio "Goyo" del Pilar (Paulo Avelino) is tasked to lead the Philippines' revolutionary forces against the Americans. Alongside him are his brother, Col. Julian del Pilar (Rafael Siguion-Reyna) and dear friend Col. Vicente Enriquez (Carlo Aquino). To the Filipinos, Goyo seems to have everything under control. He is confident, loved by many (especially the ladies), and people look up to him. "Ikaw ang agila," as mentioned by his brother. But there is a side of Goyo that Filipinos do not know or have not seen. Underneath all his charm and success lies an internal struggle, and it just goes to show that in every battle, even the strongest, most idolized heroes are still human beings. Goyo: Ang Batang Heneral is a movie that shows the human side of famed and glorified heroes. Paulo was last seen in the movie Kasal with actress Bea Alonzo. He also starred in the musical film Ang Larawan and in the romantic comedy I'm Drunk, I Love You. Prior to this movie, Rafael appeared in one of this year's Cinemalaya entries, ML. It's an independent film about a soldier who served during Martial Law. He is also known for his roles in the TV series Kambal, Karibal and the movie Hari ng Tondo. One of our fave '90s kids is making his way back on the big screen. He was last seen in the movie Meet Me In St. Gallen starring Bela Padilla. Carlo also had roles in the movies Throwback Today and Bar Boys. This 28-year-old actor last appeared in the film Mata Tapang and Spirit of the Glass 2: The Hunted. After his appearance in Heneral Luna, Arron starred in the short film Angelito, which was also directed by Jerrold Tarog. Mon was last seen in Chito S. Roño's film, Signal Rock. In the past years, he has taken on several roles in the TV series Maalala Mo Kaya on ABS-CBN. This Filipina-Italian actress is known for her roles in the films Si Agimat Si Enteng Kabisote At Si Ako and Si Agimat At Si Enteng Kabisote. Goyo: Ang Batang Heneral is a sequel to the 2015 film Heneral Luna and is produced by TBA Studios. They're also the production company that created films such as I'm Drunk I Love You, Smaller and Smaller Circles, Sunday Beauty Queen, and Birdshot. The creators, cast, and crew of the film went on a nationwide school tour. They visited Siliman University, Asia Pacific College, De La Salle University, Xavier University, and Philippine Normal University, among others. Paulo Avelino attended lectures by Filipino historian Ambeth Ocampo to prepare for his role as Goyo. The final movie in the war trilogy will be about President Manuel L. Quezon. In Heneral Luna and Goyo, a young Quezon was played by Benjamin Alves. The mid-credit scene in the film, however, hinted that an older Quezon will be portrayed by TJ Trinidad. One of the film's main theme songs is "Susi" by indie band Ben&Ben. Director Jerrold Tarog even took part in the recording by playing the drums. What I liked most about this film was its cinematography and production design. The aerial shots, specifically the ones highlighting Tirad Pass, really stood out for me. I'm not really sure if I'm making this up but I think those particular shots were filmed in such a way that it would resemble that of an eagle's perspective. Eagle = Goyo. Mind blown. The production design was excellent. From the costumes to the props, I can say it definitely captured the period setting. Hands down to the set design crew who built most of the sets from scratch! Choosing Las Casas Filipinas de Acuzar as one of the locations was also a very good call because that place is just perfect for the film's time period. As for the characters, I think Paulo Avelino was a good fit for the role. He did a good job in delivering the right amount of authority that was required of him, especially since the personality of his character isn't strong and intimidating. Carlo Aquino and Rafa Siguion-Reyna were also commendable for their roles. Their chemistry with Paulo was very natural, and the bromance was evident. Though the formation of their small group with Arron Villaflor was somehow forced, it was entertaining to watch the four men experience friendship and brotherhood together. However, one of the characters that didn't resonate well with me was Remedios Nable Jose (Gwen Zamora). I didn't really feel that she was the love interest of Goyo. There was more passion for Goyo from the three Filipinas who were crushing on him during the fiesta. Overall, this film excelled through its visuals and characterization but it lacked in its storytelling. Goyo was a completely different film from Heneral Luna. While Heneral Luna revolved around the themes related to authority, strength, and war, Goyo felt more emotional and light. It had more heart, in a sense that it tackled love—for a significant other, for oneself, and of course, for one's country. Every Filipino! Goyo is a film that shows a piece of our history in a very emotional, yet artistic manner. With everything that's been going on in the country at present, this film will seriously make you think about nationalism and patriotism.